The Abyssinia Crisis was a conflict between Italy and Abyssinia (present day Ethiopia) which ended up seriously undermining the authority of the League of Nations. There was two reasons for the invasion. In the late 1800s, faced with economic trouble, Italy needed to join in the "Scramble for Africa" that the rest of Europe was participating in so that it could expand economically. However, by the time that Italy had been unified and was ready to expand, all the best territories had already been claimed. So, Italy looked to Abyssinia to expand. In 1896, however, the Italians were defeated at the Battle of Adowa. This defeat dented Italian pride, but it also stoked the desire for vengeance against the small nation. Another reason was the desire to prove to the world of Italy's power. Benito Mussolini was himself as a second Julius Caesar, and believed that one day he would command another Italian Empire. To forward that ambition he saw Abyssinia as a prime target. The conflict started when Mussolini accused the Abyssinians of agression at an oasis called Wal Wal in December of 1934. Italy then proceeded to invade in October of 1935. Since both Abyssinia and Italy were members of the League, Abyssinia immediately appealed to the League of Nations for help, which the League responded with an economic sanctions on Italy. 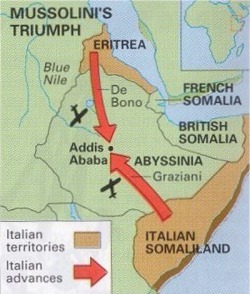 However, it was ineffective, and so the invasion continued unhindered until the capital, Addis Ababa surrendered in May 1936 and Abyssinia, combined with Ertrea and Somaliland, was renamed into the Italian East Africa. This conflict involves the concepts of: Confrontation, Internationalism, Cooperation, National Security, Global Collective Security, Alliances, Expansionsm, and Conflict. The Abyssinia Crisis proved to the world of the ineffectiveness of the League of Nations. It showed everyone that the major powers could not be bothered to support the smaller nations when they were in trouble, making the concept of collective security laughable. It also showed Hitler that he could get away with expanding Germany’s borders, as the major powers could not be bothered to come to the smaller nation’s defence. As well, Italy’s abdication from the League of Nations left them free to form an alliance with Nazi Germany instead. The Economic sanctions that the League imposed on Italy were not only useless, but was even ignored in some countries. It took the League six weeks to organize, and the sanctions did not even include vital items such as coal or oil, either of which would have stopped the Italian war effort. As well, several countries, such as Russia and Austria, did not even put the sanctions into effect, but completely ignored the League’s efforts. The British and the French also gave the Italians access to the Suez Canal, which was a major Italian supply route into Abyssinia. Without this highway, the Italian forces would have been hard pressed to keep their troops well supplied. Also, in an effort to end the war, Britain and France organized the Hoare-Laval pact in December 1935. It stated that Italy would be allowed to have the northern province of Tigre and the Ogaden area. Italy would also have economic rights in southern Abyssinia. It gave only a strip of land in the middle of the country, the “Corridor of Camels” to the Abyssinians. In return the Italians had to stop the war. Mussolini accepted the plan, but once the plan was revealed there was outrage in Britain. The public saw this plan as a betrayal of the Abyssinian people. This outrage caused to plan to be dropped, and so Mussolini continued the invasion. The League’s involvement was a disaster. It showed the world that any action that any economic sanctions could simply be ignored, and that even when it was enforced it would be ineffective. It showed how weak the League was that it was unable to even protect its own members from attack by another member. As well, since Italy turned away from the League, it showed the world that anyone could simply walk away from the League without punishment. This had another effect- since Italy had now severed ties with the League, it needed someone else to turn to- that someone was Germany.